(Left to right) Lisa, Jerry and Adrienne Buckler walked to support the cause. (Left to right) Volunteers from SSU's Occupational Therapy program Juli Uchaker, Paige Simon, Kassi Fawcett and Allie Beason. Saturday, Sept. 23, the Alzheimer’s Association of Greater Cincinnati hosted the Southern Ohio Walk to End Alzheimer’s at the Shawnee State University campus for their second consecutive year. The Greater Cincinnati Service area covers 27 counties in northern Kentucky, southeast Indiana, and southern Ohio and has hosted a walk in Portsmouth for the past 14 years. Walk Manager Jeff Dehner was overwhelmed with the amount of support the walk received from the Portsmouth community this year. “There are 37 Walks to End Alzheimer’s in Ohio. This walk grew the most in percentage than any other walk. We’ve gotten a lot for support from the community,” said Dehner. The walk raised money for funding vital research, as well as education programs like the upcoming Southeastern Ohio Dementia Education Conference along with other “boots on the ground” support programs. Participants of the walk received a T-Shirt, as well as a flower pinwheel, which indicated that individual’s relationship to the disease, ranging in five different colors. A new concept, the white flower which is new to the walk this year, represents the promise of Alzheimer’s first survivor. Volunteer and Shawnee State University student Paige Simon was more than happy to be a part of this year’s walk. At its conclusion, the walk brought in over 450 participants with the help of 40 volunteers, to bring the fundraising total to $50,000 to date, with donations still being accepted until December 31st of this year. Walk Manager Jeff Dehner stressed the importance of reaching out to services provided by organizations like the Alzheimer’s Association of Greater Cincinnati for those with close connections to the disease. “We want people to know that if they have someone in the family struggling with this disease they don’t have to go it alone. We want people to know we have free programs and services available to them to help navigate through this very difficult journey. The walk is a lot of fun, we try to make it a very positive and meaningful experience. We like people to come out and have a good time, and learn more about what we do and the services we provide,” said Dehner. 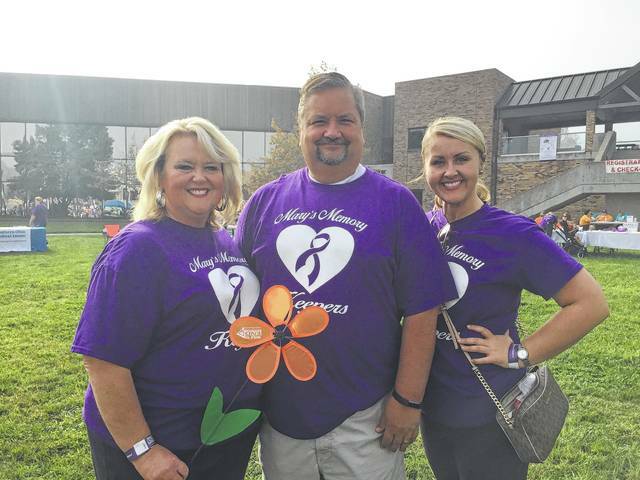 https://www.portsmouth-dailytimes.com/wp-content/uploads/sites/28/2017/09/web1_Alzheimers1.jpg(Left to right) Lisa, Jerry and Adrienne Buckler walked to support the cause. (Left to right) Volunteers from SSU’s Occupational Therapy program Juli Uchaker, Paige Simon, Kassi Fawcett and Allie Beason. 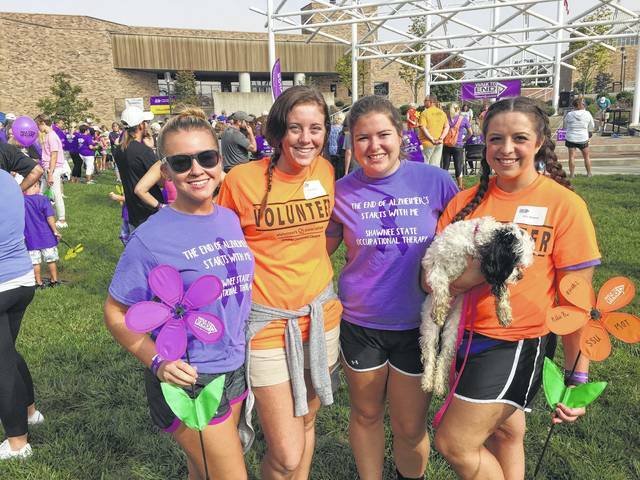 https://www.portsmouth-dailytimes.com/wp-content/uploads/sites/28/2017/09/web1_Alzheimers2.jpg(Left to right) Volunteers from SSU’s Occupational Therapy program Juli Uchaker, Paige Simon, Kassi Fawcett and Allie Beason.